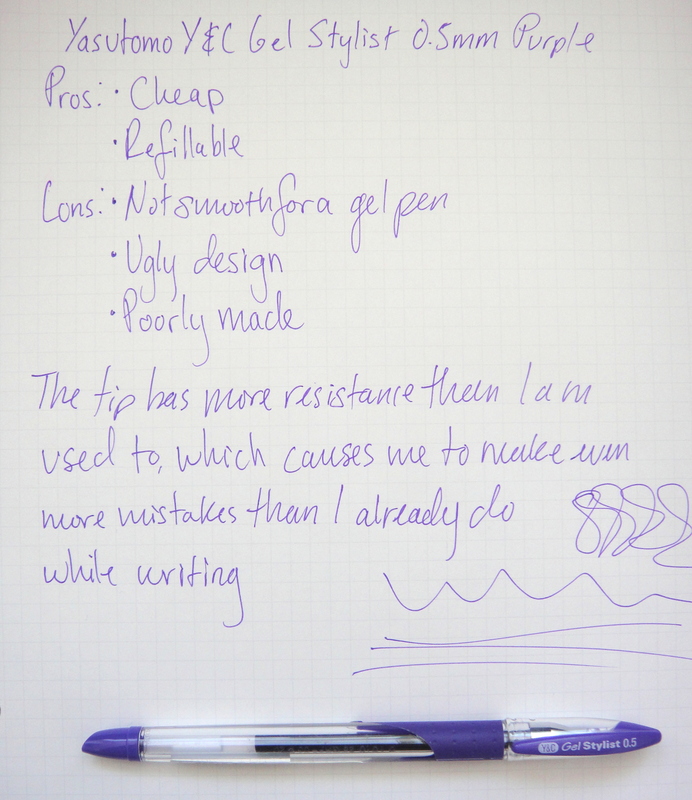 The Yasutomo Y&C Gel Stylist is an ugly and cheap refillable gel pen. The rubber gel grip is short on one side and long on the other, ending at a bump that prevents the pen from rolling on a flat surface. There are two big ugly seams that run the length of the pen. The chromed plastic tip unscrews allowing you to change out the refill. I found an unusually amount of resistance on the paper with this pen which made it hard to write in my messy cursive-esque hand. The ink like most gel inks is bright and vibrant. At $1.30 there are a lot better gel pens out there like the Pentel EngerGel X and the Sakura Gelly Roll.